There were numerous comments about the sanctuary itself from the “brainstorming” meetings which corresponded with a number of ideas which the task force had also explored. A flexible chancel area, more intimate seating arrangement and moving the table and worship leaders nearer the congregation were just a few. 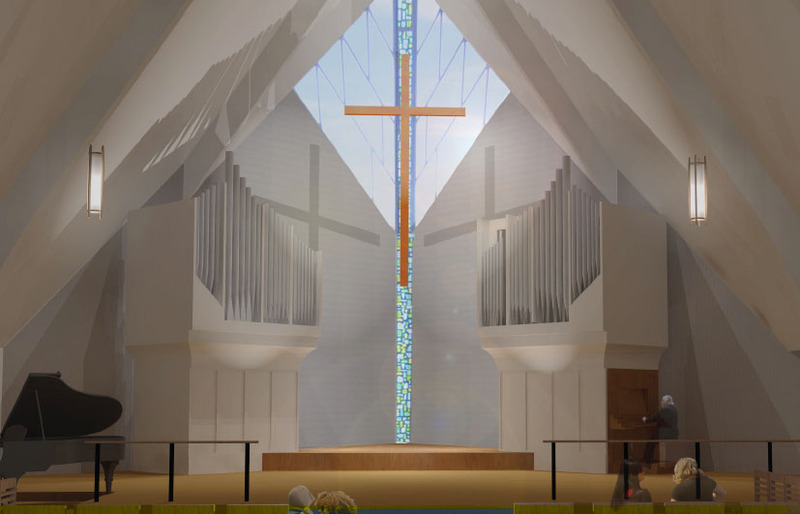 Based on the task force recommendations, the current design envisions moving the focal point for music (organ, choir, music leaders) from the choir loft to the front of the sanctuary. These ideas ranked very high in the responses from the “brainstorming” congregation meetings. 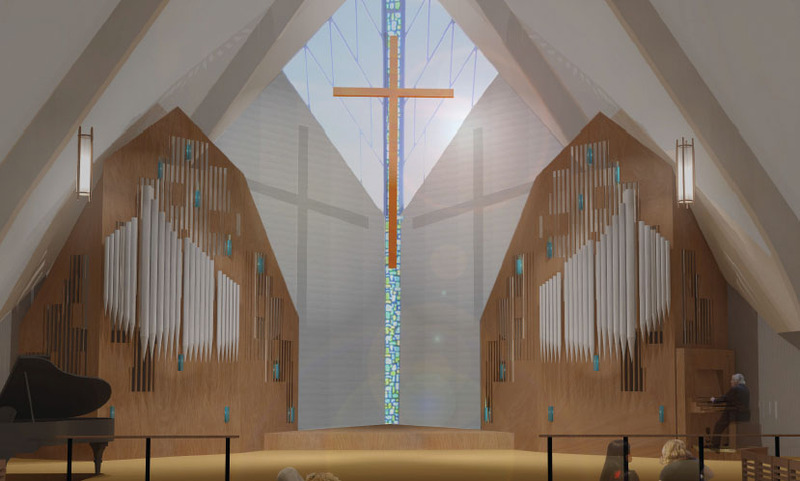 A new organ is being designed to integrate the best elements of the current Trinity organ and the Grace Lutheran organ, which is currently in storage. 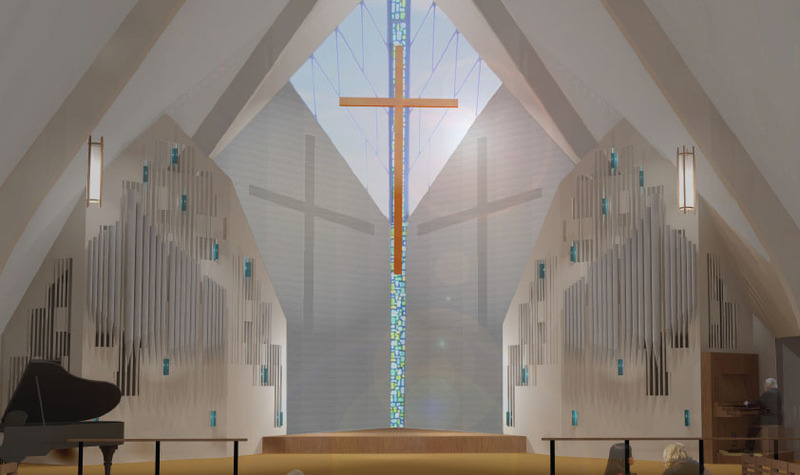 In an attempt to create a strong instrument integrated with the existing architecture and retaining the cross shadows, the architect and organ builder have proposed several designs for consideration. Removal of the “Popcorn” Ceiling Material: The task force report recommended removing the “popcorn” finish material from the sanctuary ceiling to improve the acoustics of the space. Additionally, the “popcorn” spray-on material contains asbestos at a high enough level that if disturbed would be a health hazard. 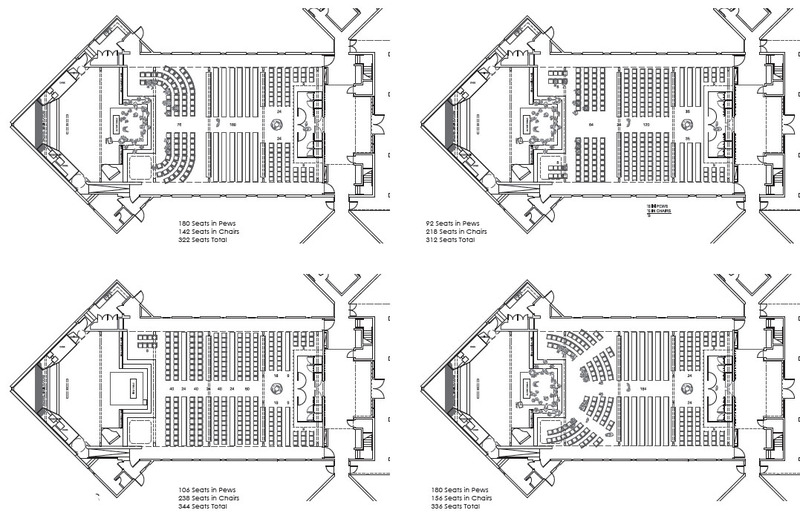 Raised Chancel Area: As expressed by many in the congregation “brain-storming” meetings the current service with the pastor and other worship leaders in the service up on the chancel and in the pulpit seems distant and separated from the assembly. There was a strong opinion in agreement with the task force desiring to see that change. The current immoveable stone altar would be replaced with a wood table. Those elements should be of appropriate size and dignity. A kneeling communion will also be accommodated in a manner that is accessible to all. Baptism Font: The task force report suggested moving the font to a location nearer the entry to the sanctuary so that is more readily accessible to the assembly at all times. 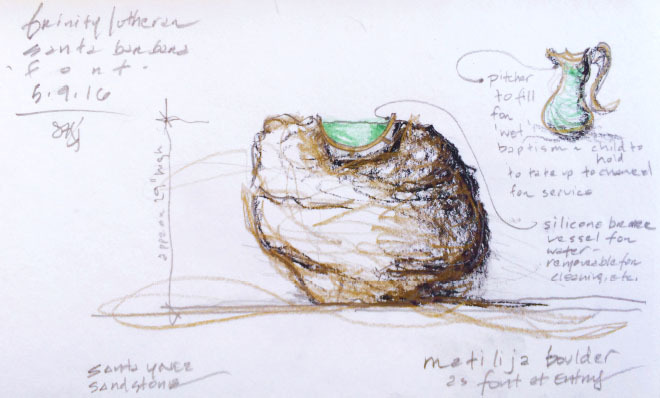 Architect Susan Jones has suggested a font design drawing in elements of the native sandstone visible in the mountains from the sanctuary. 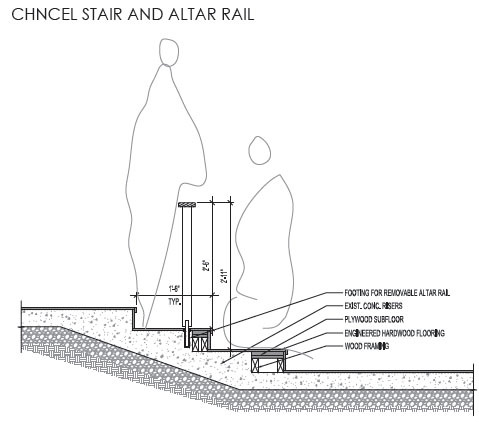 One potential design is sketched below.